Keel of the first Coast Guard Offshore Patrol Vessel of the new 5 CGOPVs Project for the Indian Coast Guard was ceremoniously laid at Goa Shipyard Ltd on 20th March 2017 by ADG K Natarajan, PTM, TM Coast Guard Commander (Western Seaboard), in the presence of RAdm (Retd) Shekhar Mital, NM Chairman and Managing Director, GSL, Directors, DIG Atul Parlikar, CGRPS (Goa), and other senior officials of the Coast Guard and GSL. It is noteworthy that a contract for 5 CGOPVs was signed by GSL with MoD on 26th Aug 2016 and commencement of production was formally started within 3 months with formal steel cutting on 13th November 2016, at the hands of Hon’ble Prime Minister of India Shri Narendra Modi. Now, within further 4 months, company has started construction of multiple blocks concurrently. It may be recalled that GSL has delivered 4 big size OPVs in a short period of 15 months, resulting in GSL having unique distinction of delivering highest combined CGT of 7700 Tonnes within a year, among all Shipyards in the country. 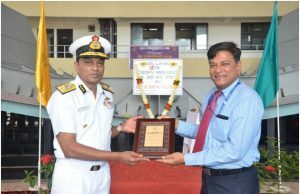 RAdm (Retd) Shekhar Mital, NM, IN CMD, GSL in his message said “The Yard is already in the process of executing the 6 CGOPVs Project, of which 4 ships have been delivered all ahead of contractual delivery schedule. The balance ships too, are progressing ahead of schedule. The next Project of 5 OPVs will be built in a reduced build period of less than 3 years each. These vessels for the Indian Coast Guard are based on in- house design of GSL and will be fitted with most modern and technologically advanced machinery and computerized controls systems, making them the most advanced Patrol Vessels in service with the Indian Coast Guard on delivery. These 2400 tonnes vessels will be equipped with additional features like Quick Response Boats for rescue and anti piracy, Gunnery simulators and many more advanced features. The hull would be the most efficient form designed by GSL and would provide for fuel efficiency, crew comfort and excellent sea keeping qualities. Incidentally, this was the first keel laid in the modernized facility developed under Phase 3A of Shipyard’s ambitious Modernisation Program, inaugurated by Hon’ble PM Shri Narendra Modi on 13 Nov 2016. The ships will thus be built in covered sheds, providing improved environmental protection, leading to high quality of construction, besides improved productivity with conducive environment for workers. Owned by GSL © 2016 Goa Shipyard Ltd. All rights reserved.